James was born in Columbus but moved often and did not discover the Gospel until he joined a PCA church in Orlando Florida at the age of 13. He attended Covenant College where he met his wife Laura. 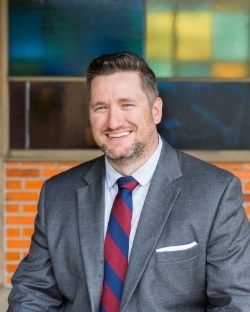 James went on to attend Covenant Seminary and after graduation served as Associate Pastor at Northwest Presbyterian Church in Dublin, Ohio for nine years. James and Laura have two daughters: Audrey and Emmaline. In addition to family/princess time James loves writing, coffee, exercise (non-running), and watching other people exercise at The Shoe (Ohio Stadium). Heath was raised in Canton, Ohio and graduated from The Ohio State University. It was during his time in undergrad that he came to understand the beauty of the gospel and then was later set-up to emcee a Cru retreat with his future spouse, Emily. After graduation, Heath and Emily spent time in Venezuela, Seattle and then attended Covenant Seminary in St. Louis. Heath and Emily have one son, Hudson. Heath enjoys spending time with his family, running, reading, architecture and has high hopes for the U.S. Men’s soccer team. Our church is committed to leaving Hilliard, Columbus, and the world, better than we found it. We want our city to be glad that we're here even if they never walk in the door of our church. Jacob leads our City team, a group that thinks about project-based ways to bless our neighborhoods. They plan projects, figure out how to make greatest possible impact, and help our congregation connect to those opportunities. Joel is helping to lead our brand new youth ministry, Genesis. They meet Sunday nights at the church house to study God's word, community-bond, and learn about how to be more like Jesus even while you're a student. Spiritual formation is being shaped by Jesus for life. At New City that includes not only what we learn, but what we do. From Sunday morning worship to midweek bible studies and community groups, children's church and student ministry, we want everything we do to make us healthy followers of Jesus Christ. Mallory leads New City's ministry to kids. At New City we take the nurturing of children very seriously. Mallory oversees our weekly children's church and leads our ministry team devoted to building a place for kids to grow up strong in a community of faith. If you've spent any time at New City, you know that we want people to "belong before they believe." One way we do that is to throw frequent parties where we can welcome guests and communicate the bigger welcome of the Gospel. Planning that ideal gathering is a huge job and Sarah leads our team dedicated to the task. If something fun is happening at New City, Sarah's team helped us do it.